Yesterday, Dr. William House died at the age of 89. Although we never met Dr. House he has a profound impact on our daily lives for he was the founder of the cochlear implant - a device that allows many people who are deaf to hear. 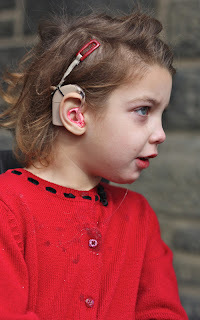 My daughter, Emma, is deaf and is a bilateral cochlear implant (CI) user and they have changed her life. When Dr. House started working on CIs the medical community thought it couldn't be done, he suffered from harsh criticism from his peers and was encouraged to abandon his work. Still, he persisted and succeeded when the FDA approved the first CI in November 1984. Sometimes I wonder what our life would be like if Emma couldn't hear. I know it would be drastically different than it is today. When Emma first started using her CIs, while her brain was trying to make sense of the sound input, the first major change we saw was how she started to really move her head around. If you can't her what is behind you or in the other room or what is going on off to the side and CP makes it hard to lift - let alone move - your head there would be little reason to move it around. Once Emma could hear she started looking around her more, curious as to what was going on, and we noticed a significant improvement in her head control. We knew CIs would give her access to sound, but didn't realize that it would have such a positive impact on her physically and were overjoyed that it did. Unable to use sign language due to her severe cerebral palsy (CP), communication options would be very limited if Emma couldn't hear with her CIs. In her early days we took classes in ASL, formed relationships with Deaf individuals, watched all the Signing Times vidoes and did a lot of signing with Emma. She was one year old before she received her first implant and it was important to us to give her access to language during that time. We also wanted her to know some ASL in case her implants didn't work well. Outside of her own version of all done, though, her CP makes it very hard to imitate signs so we eventually phased out the signs in favor of more oral language as her use of her CIs improved. Today, Emma lives in an oral world where understands everything people say to her thanks to her CIs. She talks through an eye gaze augmentative communication system since her CP makes it very difficult for her to speak. Her CI's made this possible. We are forever indebted to you, Dr. House, and are thankful that you went on to prove all those who said it couldn't be done wrong. You can read Dr. House's obituary here.